This book is about comprehensive psychosocial as well as physical care for patients with cancer and their families, regardless of where they are in the course of their disease. It focuses on suffering in patients with cancer, offering symptom-oriented, person-focused treatment. The first section is about communication and interaction between the treatment team and the patients and their families. There is a new chapter, ‘Working with Patients’ Families’, written with a social worker, Arden O’Donnell, that I thought was particularly useful. We all complain about dealing with difficult families, and this chapter provides a useful outline of how to assess families and how to deal with some of the common problems. The second part of the book (making up about three-quarters of the text) is about pain control and symptom management. There are chapters on pain assessment, the pharmacologic, and non-pharmacologic management of pain, followed by a discussion of other distressing symptoms. My only quibble is that it was difficult to quickly refer to a particular topic. The chapters are prefaced with a list of topics but page numbers are not given; and if the chapter is 100 or 150 pages long… But the book seems to be well indexed. The final chapter is about managing the dying phase and looking after the bereaved. Because of the focus on physician-assisted death in this month’s other books, I looked with interest to see what Abrahm had to say. She provides a calm and reasoned discussion, focused on patient suffering. She quotes Kathleen Foley in pointing out that, for the healthcare professions across the board, the level of education about palliative care and the relief of suffering is very poor. This book differs from other texts on palliative medicine in that it takes a more holistic approach to the management of suffering (including pain and symptoms). I liked the liberal use of clinical vignettes and snippets from conversations to illustrate the principles of better patient management. It will be a useful reference for anyone working in oncology and palliative care, and should be compulsory reading for trainees in any branch of oncology. And I thought it was very reasonably priced. RRP $US74.95 (Not listed on Amazon). 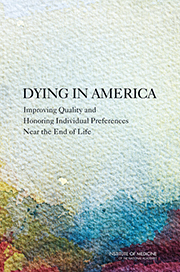 This Report, by an expert committee convened by the Institute of Medicine (IOM) of the National Academies is about the universal provision of comprehensive care, including hospice and palliative care, for people with advanced serious illness who are nearing the end of life. The brief for the committee was daunting. To assess the delivery of medical care, social and other supports to the patient and the family; patient/family/provider communication of values, preferences and beliefs; advance care planning; healthcare costs, financing and reimbursement; and the education of health professionals, patients, families and the public at large. And to explore approaches to advance the field. Not surprisingly, they concluded that the U.S. healthcare system is poorly designed to meet the needs of patients and their families at the end of life and that major changes are needed. However, the report suggests that broad improvements in end-of-life care to make it compassionate, affordable, sustainable and high quality are within reach. I was drawn to the more clinical issues, including advance care planning and how physician education might be changed to improve end-of-life care. For example, Recommendation 2: ‘Professional societies and other organizations that establish quality standards should develop standards for clinician-patient communication and advance care planning that are measurable, actionable and evidence-based.’ That would be a big step forward. In a New England Journal of Medicine Perspective, the co-chairs of the IOM committee note that 80 and 88% of American physicians surveyed in two studies indicated they would choose to forgo high-intensity end-of-life treatment (Pizzo PA and Walker DM: Should we practice what we profess? Care near the end of life. N Engl J Med 372: 595, 2015), and ask why we physicians are not helping more patients express their preferences so that they can make informed decisions about the care they want near the end of life. I liked the discussion of inadequacies in professional training, even going back to the ‘death is seen as a medical failure’ excuse. Whilst this Report is written about and for the United States, many of the issues discussed are pertinent to other countries, both developed and developing. And there is a wealth of information and thought as the (long) list of problems and barriers is discussed. The report can be purchased, or read or downloaded as a free PDF file (but you may need to take out a free registration and login). Hospice and palliative care is alive with ethical issues and this book, with a commendable list of contributors, sets out to discuss them. The opening chapters discuss hospice and palliative care in general, and ethical issues arising from modes of delivery in particular. Following this is a series of chapters about ethical issues related to pain relief, dyspnea, delirium, and psychosocial and psychiatric suffering. The nitty-gritty of the book is in the last section – Difficult Decisions Near the Very End of Life. There are good chapters on withholding and withdrawing life-sustaining treatments, voluntarily stopping eating and drinking, and on medical futility. Andrew Billings’ chapter on palliative sedation provides a good description of what we are talking about, where it fits in the ethical scheme of things, and underlines the responsibilities of the physician. The chapter on physician-assisted death by Quill and Miller left me dissatisfied and I did not agree that relieving a patient’s symptoms with treatment that you knew might hasten their death, but in no way intended, was the same as popping them off. The chapter on physician-assisted suicide by Ganzini was interesting but did not add any important new information. I was most interested to read that her proposal for a study on whether receiving a prescription resulted in reduction of anxiety and increased sense of peace (an interesting and worthwhile question) was blocked by the pro-PAS organization. The final chapter is about physician-assisted death in Western Europe, The Netherlands in particular. I ran into a few bumps here. She starts with the Dutch data that ignores intention, and follows with the European studies. The Australian study, conducted I believe according to the same Dutch criteria, was deceptive in its ambiguity: if you said you had given a patient medication that you knew might possibly shorten their life, although you had no intention of so doing, you were counted as having intentionally shortened the patient’s life. She tells us that ‘termination of life without request is declining since 1990.’ But the numbers stayed the same during the period 1990-2001, amounting to around one thousand patients a year, euthanized without request; the first significant fall was in the 2004 report. She tells us that palliative care services in The Netherlands are among the best in Europe, based on criteria such as attendances at palliative care conferences. She tells us that reporting levels for euthanasia have increased remarkably, but not that this is due to the fact that doctors no longer have to report opioid-related deaths because someone, somewhere else in the world, reported that opioids given appropriately were not associated with hastened death; that doesn’t apply if you give a lethal dose, intentionally. I didn’t see any mention of the recent rapid rise in the use of terminal sedation, which some have reported as being used in place of euthanasia (i.e. to intentionally hasten the death of the patient), because it doesn’t have any of the legal connotations of euthanasia. Overall, this is a good synopsis of the range of ethical issues encountered in palliative care, including the delivery of services, patient suffering and physician-assisted dying. It will be useful in the postgraduate classroom and should be of interest to anybody working in palliative care. Just don’t believe everything you read about euthanasia in The Netherlands. 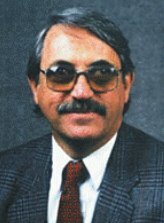 L. W. Sumner is Professor Emeritus of Philosophy at the University of Toronto. This is his admittedly partisan contribution, from an ethical and legal perspective, to the debate about assisted death. I note he describes it as an ethical, social, political and legal debate – medical doesn’t seem to come into it. The first section is about Ethics. He discusses refusal of life-sustaining treatment, followed by a long discussion about double effects, which he describes as ‘relieving suffering and causing death’. This is the first hole he digs for himself, referring to the treatment of patients with increasing doses of opioids as having a probable or certain chance of hastening death; foreseeing a possibility of hastening death doesn’t come into it. To his credit, he mentions that some maintain that appropriate doses of opioids do not shorten patients’ lives, but I’m not sure he believes it. The Australian study (and similar studies from elsewhere) is trotted out to show that doctors frequently use doses of drugs in terminally ill patients that may hasten death. I was sent a copy of that Australian study, which I failed to complete. The questions were deliberately ambiguous, so that doctors who admitted they had given a patient opioids that might possibly have hastened death (but of which they had no intention), were classified as having intentionally given doses of medications they knew to be lethal. Which is just the result the investigators wanted. Utter rubbish, but the results turned up on the front page of the Sunday newspaper. I can’t remember the headline, but it had to do with doctors and killing. Sumner makes much about how much a life might be shortened, perhaps to lessen the psychological impact if only a seemingly trivial amount of time is involved. The truth is that no one can know exactly how much a life is shortened by euthanasia, but the Dutch are notorious in this regard. I remember commenting in the mid-1990s on the euthanasia of a young man with AIDS whose life-expectancy using internationally accepted criteria, and using treatment available at that time, was in excess of two years. The Dutch said his life was shortened by less than a month, at the most. The next chapter moves on to euthanasia and physician-assisted suicide that, from an ethical perspective, Sumner sees as no different from treatment with the possibility of hastening death. I do not agree. The physician’s job is to relieve suffering, and killing people is not an option. Intention is a big thing. The last chapter in this section is about deciding for others – the formerly competent and the never competent. Sumner argues that where there are no advance directives and the patient is not competent, the principle of ‘acting in the patient’s best interest’ trumps all other considerations and is sufficient to make decisions about euthanasia. I definitely do not agree, and such an argument brings what happened in Nazi Germany back into the debate. Adopting such attitudes in a palliative care unit, or the geriatric or psychiatric wards, is to me unthinkable. As a doctor, I would consider doing a ward round thinking about who can or should be euthanized would constitute, to use the Dutch term, unbearable suffering. Having argued to this point, I suppose Sumner has no reason to worry about euthanasia without request (one thousand patients a year in The Netherlands), euthanasia for treatable conditions like depression, or the recent marked rise in the use of terminal sedation in The Netherlands, which some report as being used as an alternative to euthanasia (i.e. for the intentional hastening of death) that does not carry any of the legal connotations of euthanasia. Having satisfied himself that all forms of assisted death are morally permissible in given circumstances, the second half of the book is about legal matters, but I am not a lawyer and my interest had waned. I am sure Sumner will have come up with a means to make euthanasia legal, but not one to control it. Control was not a major issue in the ethics section. The problem here is that the clear-cut theoretical case studies used are all very well for discussions held in ivory towers, but do not come close to covering the myriad variations (of patients, families, medical situations, and healthcare professionals, not to mention differing cultural values and beliefs) seen in the real-world ward or clinic. Sumner refers to people holding views opposite to his as having the Conventional View, although I was left wondering whether the capitalization represented respect or the opposite. I also noted that in his discussions, the patient subject is always referred to as ‘her’. This book is well written and I would recommend it to anyone interested in the debate about assisted dying. It’s just that I do not agree with some of the things it says.